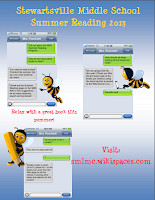 Greenwich Township summer reading is going digital! Details for the elementary and middle school programs have been posted to the school wikis. 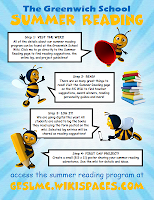 The programs follow the traditional model of summer reading with small modifications that allow students, families, and teachers to effectively use the tools available. Students are to read, read, and read some more. They may choose to read whatever they like, so long as the material is appropriate to their maturity, abilities and understanding. Reading suggestions and reviews are posted: Battle of the Books lists, award winners, teacher recommendations, student suggestions, and book review sites are all accessible from the summer reading pages. Students log their reading. This log helps teachers to see reading preferences and frequency during summer break. This year there are no paper logs to print, keep track of, or lose. All logs, for all students, will be maintained digitally. Data is gathered using a Google form embedded on the summer reading page. This data is immediately accessible to the Media Specialist, building Reading Specialists, and Language Arts teachers. Students are asked to write a single sentence review of each logged book, maybe 2 if they absolutely must. We discussed the importance of understanding our purpose and audience in writing. As log entries are reviewed, a select group of reviews are moved to a public spreadsheet that serves to provide reading inspiration to students. Students will complete a simple project for the first week of school. Elementary projects will inspire students in the halls and Media Center. Middle school projects will be discussed in class and cover the walls (print projects) or wiki (digital projects).